Websites gleefully publish documents about celebrities - but the paper trail still follows people from history. The National Archives is shedding light on the little-seen paperwork behind some of the UK's biggest movers and shakers, and in an exclusive preview for the Magazine we start by looking at Karl Marx. Marx - philosopher, social scientist, historian, revolutionary and... British newspaper shareholder? Documents shedding light on the years spent by Marx in the UK are about to be put on display at the National Archives in Kew. The exhibition Movers and Shakers provides manuscripts and artefacts belonging to some of the most influential figures in British history, from Geoffrey Chaucer to Elton John. It discloses that one of the world's most famous social thinkers invested £4 as one of the original shareholders on a working class British newspaper, the Industrial, which dissolved in 1883. It also documents why attempts by this hugely influential revolutionary thinker and philosopher to become a British citizen were rebuffed by the police. Although Marx did not live to see his ideas carried out, his work had a great influence in the formation of communist regimes at the start of the 20th Century. Communism became one of the leading world ideologies before its decline in the 1980s and 1990s. Bearing in mind such huge influence, the shareholders' certificate of an obscure London newspaper may seem an unlikely place to find his signature in 1865. On it Marx described himself as a doctor of philosophy, on a list which included a tailor, joiner, painter and shoemaker. Curator Sue Laurence says: "All the other shareholders have occupations listed and he's the only one without. Here are all these guys investing their money in this newspaper and all have gainful employment apart from him. "The only gainful employment he looked for was as a railway clerk and that was rejected because his handwriting was so lousy." It wasn't a surprise to find Marx involved in this kind of enterprise, she says, given his life - financed by his friend Friedrich Engels and beyond his own means - as a bourgeois gentleman. "Marx played the markets in the UK and the US and this was a bit like a cooperative because the other men were upper middle class and this was a small-scale enterprise." Karl Heinrich Marx was born into a comfortable middle-class home in Trier, Germany, in 1818. He initially followed in his father's footsteps and studied law in Bonn and Berlin, where he met his future wife, the aristocrat's daughter Jenny von Westphalen. Marx then edited a liberal newspaper in Cologne which was shut down by the Prussian government. He emigrated to Paris where he outlined his first views on communism as a cooperative production in contrast to the alienation of labour under capitalism. He was expelled from Paris and moved with Engels to Brussels, where he continued to write. They co-authored the pamphlet The Communist Manifesto which was published in 1848 as revolutions happened across Europe. It asserted that all human history had been based on class struggles but that these would ultimately disappear with the victory of the proletariat. He returned to Cologne and tried to relaunch his newspaper but was forced into exile in London in 1849. The city became his home for the rest of his life. After beginning his time in a cramped flat in Soho, he moved to Kentish town and his daughters attended a genteel academy in South Hampstead. He immersed himself in books on economics and philosophy at the British Museum reading room, where he wrote his most influential work Das Kapital, described by some as the Bible of the Working Class. 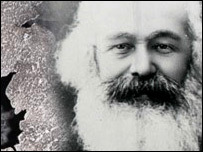 But he lived beyond his means and was helped out by Engels, who worked in his family's cotton business in Manchester. The exhibition's second document demonstrates how settled Marx felt in the UK but also how nervous the authorities had become about his politics. It came as quite a disappointment because in effect he was a stateless citizen. The Met Police report of 1874 rejects attempts by Marx to become a naturalised Briton. Sergeant Reinners turns down the application on grounds that "he is the notorious German agitator, the head of the International Society and an advocate of communistic principles. This man has not been loyal to the King". This was not disclosed to Marx, who had earlier given up his rights to citizenship in Prussia. "He probably thought this was going to go quite smoothly, having recruited respectable householders who said on affidavits that Marx was a responsible citizen," says Ms Laurence. "But unbeknown to him, a police file on him at the Home Office was getting larger. It came as quite a disappointment because in effect he was a stateless citizen." Prussian police spies wrote reports on him which also contributed to his notoriety. Despite the setback, London was where Marx spent most of his final years. The first volume of Das Kapital was published in his lifetime but the others were edited by Engels after his friend's death in 1883. He was buried at Highgate Cemetery in North London. There was only a handful of mourners at his funeral, although Engels said at the graveside: "His name and work will endure through the ages." It was an inauspicious farewell for the man who later influenced Lenin, Stalin and Mao. What he would have thought about how they used his theories we will never know. Movers and Shakers begins on 6 December and runs until 31 May 2005.